Hi guys! I hope you are all enjoying your Fall thus far. I can tell you mine has been BEYOND busy and stressful with this new job. I am feeling so overwhelmed trying to learn pretty much what the hell I am doing everyday and it has been leaving little time for much else unfortunately. I don't know about you, but sometimes if I have a bazillion things to do instead of get motivated to start tackling things, I shut down and don't do any of it. I am not sure why that is but it really interferes with productivity! I hope some of you have been doing a better job taking advantage of the perks of Fall- apple picking, hay rides, pumpkin picking, scented candles, wreaths, haunted houses..! Because I haven't been able to film a tutorial recently or write up a decent review post, I thought I could at least manage a Product of the Week. This product is so amazing for this time of year because it hydrates your under-eye area! Most of us set our undereye concealer with powder so the moisturizing effect of Erase Paste counteracts the drying properties of the powder and reduces that wrinkled look that happens with dried out undereyes. 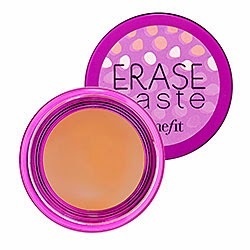 This product does an amazing job of hiding not only undereye darkness, but also blemishes! This concealer comes in a little pot that seems like it will definitely be the gift that keeps on giving. One of the downsides of this product is the packaging. You need to use a brush to get the product out (I use the Real Techniques Deluxe Crease Brush) because using your finger would probably get pretty unsanitary quick. I prefer something that I can just apply to my skin without that intermediate step. Only 3 colors :-(. Fortunately the lightest color matches my skin perfectly. For those with oily skin, this may actually be too hydrating. On hot days in the summer I couldn't use this product because it would basically melt off and end up smearing my mascara if it wasn't waterproof (cute right?). Overall, great product and a huge favorite of mine recently. What has been your product of the week?? I am glad you shared this new product. My undereye is my problem area, so this does sound promising. Thanks for the brush info too! Hope things get settled into a better routine! I have oily skin but the skin under my eyes is never oily its normal so this sounds like a really good product!